Professor William J Fry, a physicist at the University of Illinois at Champaign had a strong interest in biophysical research. During the Second World War, Fry worked on design of piezoelectric transducers at the Naval Research Laboratory Underwater Sound Division in Washington, D.C. He became professor of Physics at the University of Illinois at Champaign in 1946, and founded the Bioacoustics Laboratory. Together with his brother, Francis J Fry, they carried out research on various aspects of ultrasound with particular attention to applications in biology and medicine. Those who were part of the research team at the Bioacoustics Research Laboratory included Reginald C Eggleton, Joseph Pankau, Elizabeth Kelly, and Floyd Dunn. In the 1950s, William Fry realized that, with adequate research, high-intensity ultrasound could eventually provide a noninvasive surgical technique that might duplicate some of the results of standard invasive surgery used in psychological and neurological disorders. In pursuit of these aims, the Office of Naval Research granted him a contract to develop equipment that would produce pinpoint lesions within the central nervous system of animals. A sophisticated system designed by Professor Fry and his colleagues employed a multiple transducer system of 4 transducers that focused high-intensity sound beams to a small point, producing a pinpoint lesion without damage to surrounding tissue. This was successfully employed in the disruption of parts of the basal ganglia in patients with Parkinsonism. In 1957, William Fry, Francis J Fry, and Reginald C Eggleton founded the lnterscience Research Institute in Champaign, Illinois. In the field of medical ultrasound, the work at Interscience Research Institute had two goals: the first was the development and application of high-intensity ultrasound instrumentations specifically designed to treat neurological or other brain-related disorders of human subjects, and the second to develop computer-based, low-intensity ultrasound instrumentation for visualization of the soft tissue. The work on the high-intensity ultrasound was very successful. In co-operation with Dr. Russell Meyers, Chief of Neurosurgery at the University of Iowa School of Medicine, this instrumentation was used to treat a number of human patients suffering from various brain pathologies, and in particular Parkinson's disease. At the 1960 AIUM meeting they presented their work in a paper entitled "Ultrasound in Neurosurgery". In 1967, Fry published techniques of tissue visualization which incorporated sophisticated omnidirectional mechanisms and the use of online computer analysis to control scanning motions and positions, amplifier gain, digital timers, echo signal processing and video display. His setup was probably the most advanced at his time, which had enabled segmental construction of echograms, incorporating wide dynamic range combined with high resolution via program control of receiver gain as a function of range and echo strength. Aside from being known for his work in high-intensity therapeutic ultrasound, Fry is generally regarded as the pioneer who introduced the use of computers in diagnostic ultrasonography. William Fry's tissue visualization setup in 1967 with mainframe computer (Raytheon 520) connected on-line to a Sperry reflectoscope UM721, a modified terret drill Clintimatic DE, video display and digital timers. After William Fry's untimely death in 1968, Francis Fry became Director of Research of Interscience Research Institute. In that position, he worked with Dr. Robert Heimburger, Chief of Neurosurgery in the Department of Surgery of Indiana University School of Medicine, in demonstrating that high-intensity ultrasound could be used for the destruction of brain tumors. During that same period, Elizabeth Kelly Fry became chief investigator under a National Cancer Institute contract to carry out a three-year study on the use of ultrasound for the detection of breast cancer. 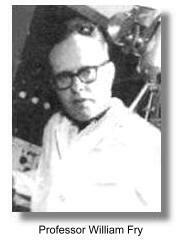 William Fry was president of the American Institute of Ultrasound in Medicine (AIUM) from 1966 to 1968. In terms of the advancement of medical applications of ultrasound in the United States, the 1952, 1955, and 1962 conferences on ultrasound at the University of Illinois, sponsored by Fry, were extremely important. The 1955 meeting was chiefly concerned with biophysical and therapeutic aspects of ultrasound, except for a presentation by John Wild and J. M. Reid on ultrasound breast examination and a presentation by Douglass Howry on his instrumentation for soft-tissue visualization. At the 1962 conference, lectures on diagnostic ultrasound were presented by speakers from the United States, Europe, Japan and other parts of the world. Adapted in part from the Eastman Kodak Health Sciences publication "Medical Diagnostic Ultrasound: A retrospective on its 40th anniversary" by Dr. Barry Goldberg M.D. and Dr. Barbara Kimmelman Ph.D. which was published in 1988.